This simple, yet unique return address label design was inspired by those weathered jersey's you used to wear out on the playing field. It meant you were one of the team. But it also helped you keep cool while competing in your favorite sport. That same mesh pattern was used to create labels that will give your letters and packages a uniform look while saving you a ton of time too. Instead of scribbling out your name and address on every envelope you put in the mailbox, all you'll have to do is peel and place these self-adhesive address labels and send those envelopes on their way. It's really a "no-sweat" solution for an everyday chore! 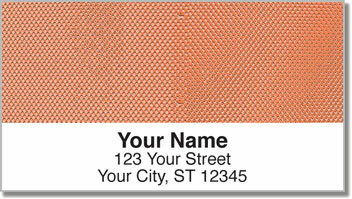 Get your own Orange Mesh Address Labels today! They're also available in several other color options. Plus, you can also order matching personal checks.